It’s the simplest email migration tool, I feel. Simple interface. In just four steps I could migrate my Gmail mailbox data -emails, contacts, calendar, and everything—to Office 365. Thanks. IMAP to Office 365 migration tool is designed to migrate mailboxes from almost all IMAP email servers to destinations like Office 365 and Exchange Server. The software supports migration to both Hosted and On-premises Exchange deployments. The migration of mailboxes is swift and completes in a few simple steps. 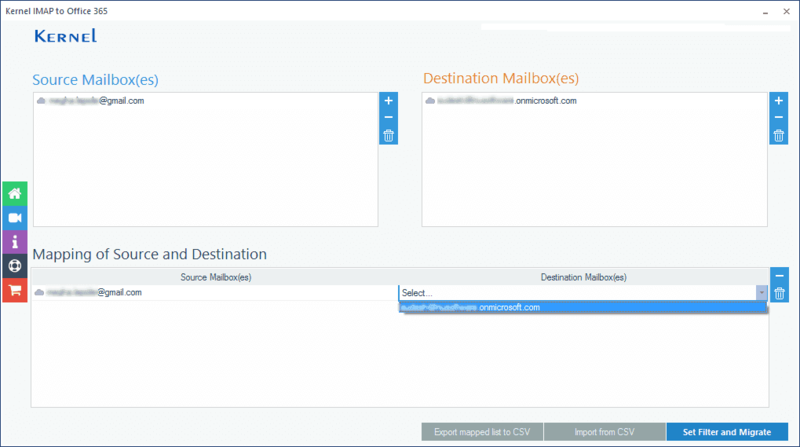 For convenience, IMAP to Office 365 migration tool incorporates a way to add multiple Source and Destination mailboxes using a CSV file. This CSV file contains Source and Destination login details along with mapping information. You can import this CSV file to the tool to automate the migration. This simplifies the migration process. IMAP mailboxes can be migrated to mailboxes, archive mailboxes, or public folder in the destination (Exchange/Office 365). So, you can migrate IMAP data to anywhere you need. 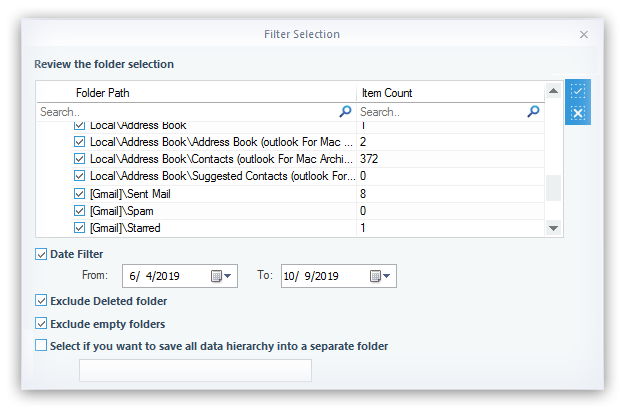 The filters allow you to migrate selected data - Date Filter filters the data by a date range, Item Type Filter filters data by item type like emails, contacts, etc. Exclude Deleted folder & Empty folders options are also available for filtration. Kernel IMAP to Office 365 tool includes an option in Filter Selection page – Skip Already Migrated Items. By selecting this option, you can migrate only the incremental data to the destination mailbox folder. It avoids migrating the already migrated items from the same Source to the destination. 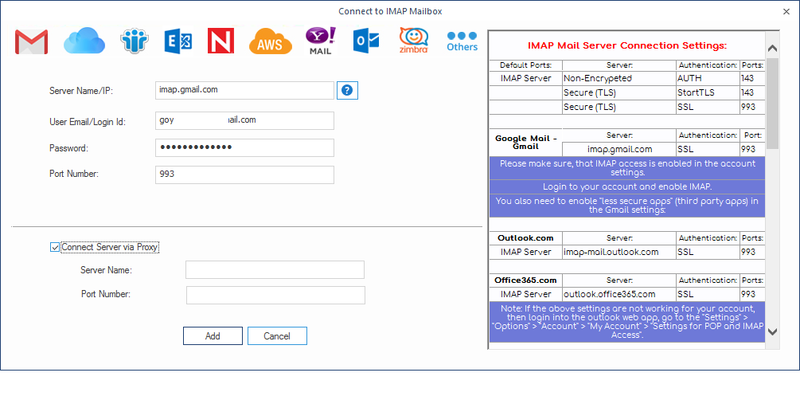 The software supports a wide range of IMAP email servers for migration. It migrates web-based email Servers like Gmail, Yahoo Mail, AOL.com, Outlook.com, etc. Other IMAP email servers supported are Lotus Notes, GroupWise, and Office 365. IMAP to Office 365 migration tool ensures complete accuracy and security of data all throughout the migration process. In all steps of the IMAP to Office 365 migration— from adding source to migrating the mailboxes— the data is not altered in any way. Once the migration process is completed, the software offers an option to save the summary report in CSV file format. 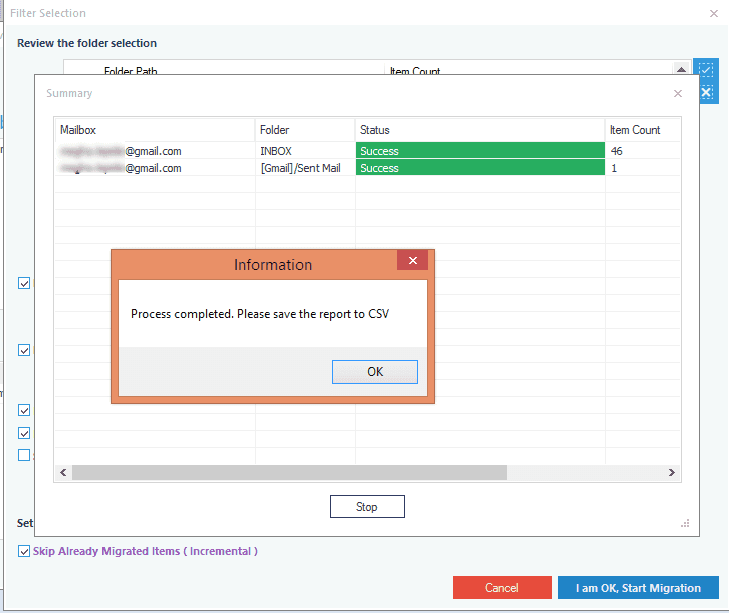 The CSV summary report includes complete details of migration like Source mailbox login ID, Folders exported, Migration Status, Item Count, etc. So, it is easy to analyze the migration process. IMAP (Internet Message Access Portal) is an internet protocol that allows users to access emails remotely from a remote mail server. The IMAP configuration makes it possible for multiple clients e.g. Gmail mails in Outlook; to access the mails in the individual mailbox. Doing this, will save local space on system and facilitates accessing emails from different locations. Let us see some benefits from IMAP configuration in email servers. 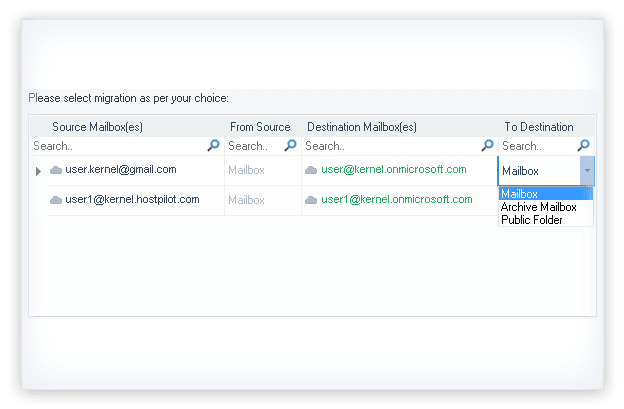 SelectAdd the required IMAP email server mailboxes as the Source and Office/Exchange as the Destination. MapSelect the specific destination to which you want to migrate your IMAP mailbox data. ImportFilter the IMAP mailbox items and migrate. How do I migrate IMAP mailboxes to Office 365? Run Kernel IMAP to Office 365 software. 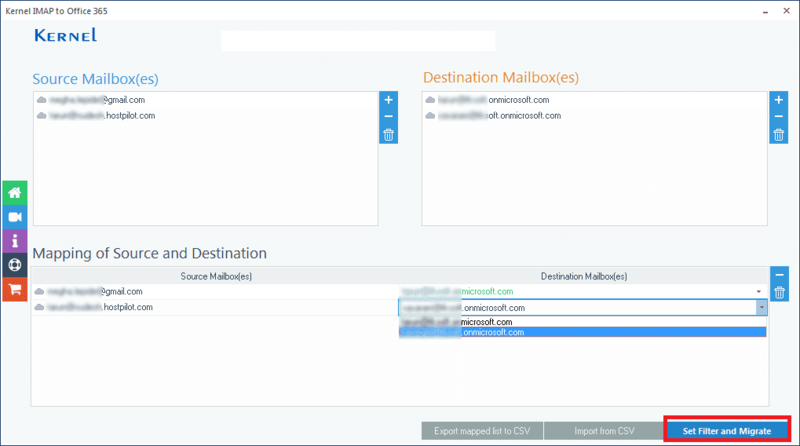 Add source as IMAP mailbox credentials and Add destination as Office 365 account credentials. 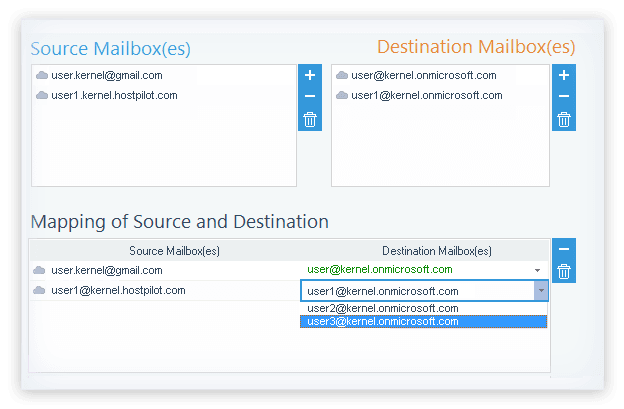 Select Single/Archive Mailbox and map source to destination mailboxes. 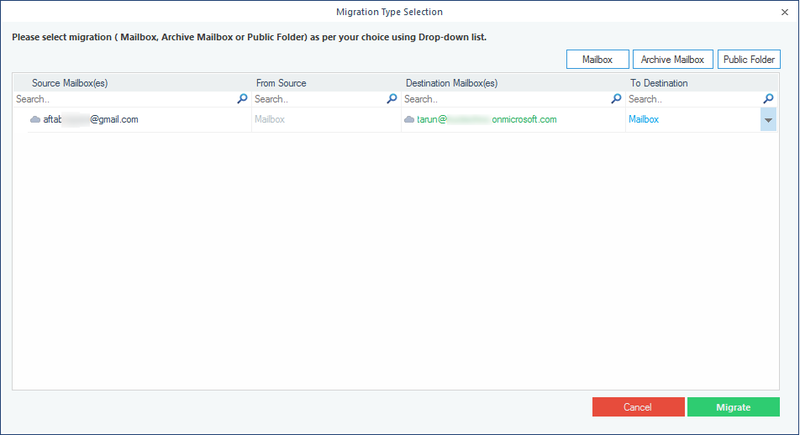 Select migration type - Mailbox, Archive Mailbox and Public Folder. Set filters if selective data saving is your priority. Finally, click I’m OK, Start Migration and save generated log report in CSV format. Does the tool support all IMAP email servers? Yes, definitely. Migrate IMAP to Office 365 tool supports all IMAP enabled email servers like Office, Exchange (on-premises & hosted), GroupWise, Lotus Notes, Yahoo, Gmail, Outlook.com, and many more. Is it true that the software includes information related to IMAP Mail Server Connection Settings? Yes, the tool displays the information regarding IMAP Mail Server Connection Settings on the right pane in Connect to IMAP Mailbox screen. You get Server name, SSL No., & Port No. from there easily for your IMAP email server. What limitations can I expect from the Free version of the tool? The only limitation with the Free version of the software is that you can migrate only 10 items per folder from each IMAP mailbox to the destination. While performing migration, can we avoid deleted or empty folders? IMAP to Office 365 migration software provides two options - Exclude Deleted folder and Exclude empty folders - that help to skip deleted and empty folders from migration. 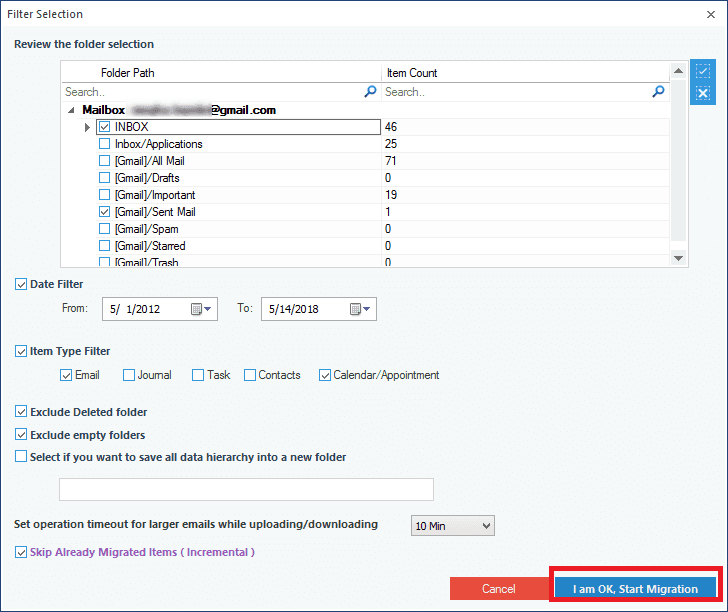 There is one more option Skip Already migrated items (incremental) that helps in migrating only incremented data in the mailbox. What is the use of CSV file for multiple mailboxes migration? Using a CSV file with Source & Destination login details and mapping information, you can add Source and Destination mailboxes directly (without adding them separately). This makes task easier. Is there any restriction on number of machine for use with Corporate License? No, there isn’t. With corporate license you run the software on multiple number of machines at multiple geographical location. Please explain the use of CSV file for multiple mailboxes migration. Prepare a CSV file with Source & Destination login details and required mapping between them. Note: For help, you can download sample file using the same name button on tool’s welcome screen. Once mapped CSV file is arranged, click Import from CSV option on tool’s welcome screen. Now, browse your CSV file and select the saved one from the site location. Your mapped Source and Destination mailboxes get added. Select type of folder and filters for migration of IMAP mailboxes data. Click Migrate option to finally migrate the mailboxes to Office & Exchange. Thus, complex migration of multiple mailboxes gets easier with CSV file. How can I know if my Gmail account is IMAP enabled or not? Login to your Gmail account with User ID and password details. Click the gear shaped icon Settings on the right-most side of the main screen. Select the tab Forwarding and POP/IMAP. If you scroll down the list, you will find IMAP Access option. Click it. Check Status: It could be IMAP is enabled or disabled. Choose your priority by clicking on Enable IMAP or Disable IMAP options. If IMAP enabled, you can easily migrate your mailboxes to Office 365 through this tool within 3-4 steps. I was looking for migrating my Gmail and Outlook.com email servers (IMAP enabled) to Office 365. My query is if the tool can migrate both simultaneously? The IMAP to Office 365 tool is capable to migrate any number of IMAP mailboxes to Office 365. Along with that, it provides privilege to users for migrating different IMAP email servers to Office and Exchange destinations. For example - If you want to save your Gmail account and Outlook.com account mailboxes to cloud, you can add them with credentials or can use CSV file for direct addition for migration. In similar way, you can migrate as many different IMAP email servers. The only thing required for migration is login details of respective email servers and destination. What is the difference between IMAP and POP3 protocols? Having IMAP configuration in email server, you can access your email from number of devices at a time. While with POP3 protocol, you can access mails in single device. - IMAP configuration requires internet connection to access emails whereas there is no need of internet connectivity for POP3 protocols (but required for sending and receiving emails). - IMAP provides faster overview of emails (only headers are downloaded) as compared to POP3 configured emails. - IMAP relates to two-way communication while POP3 provides one way communication for email servers. I want to get informed about the refund policy of the tool. Please give required details. 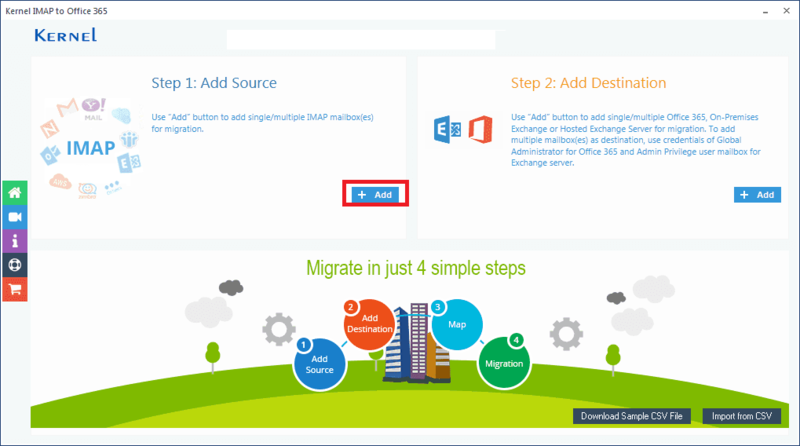 The IMAP to Office 365 migration tool provides it users a Free Trial before the purchase. It makes you go through a general overview of all the smart features along with some data migration (10 items per folder). You can try both single and multiple mailboxes data migration with this version. Once the users get satisfied with all the running features of the tool, they can buy the tool as per their wish for unlimited swift migration. Taking tool’s reliable and secured programming into consideration, there are very less chances of errors in migration. However, users can ask for any issue to our support team available 24*7 hours. The support team may ask for the file in which issue is faced with the tool. If the issue persists, our company integrates a refund policy on this software purchase. The users can avail full refund for the purchased tool, if they face issue in migration and disruption in function even after taking help from support. For refund, mail to sales@nucleustechnologies.com regarding refund of the tool mentioning the issue in detail in it. Case 1 - The user denies sending the file with issue for inspection even after signing NDA (Non-Disclosure Agreement) as the issue remains hidden. Case 2 – The user has purchased the tool but does not want to use it in future. Case 4 – Partial refund facility is available if mistakenly different tool has bought than the required one. Hello! I was trying hard to migrate my 50 mailboxes to Office 365 from last two days. I tried synchronizing IMAP folders manually, then converted them into PST format. Importing the PST files to Office was easier but during this whole migration, some important data is lost. I got frustrated with this tiring method. Please suggest a quicker and affordable solution. Synchronizing IMAP folders manually will take a lot of time and includes risk. The method you mentioned becomes lengthy as you need to convert IMAP mailboxes data to PST and then importing to Office 365. When you try to migrate emails directly from IMAP to Office 365, there are chances of errors in creating a new Outlook profile for each user and in synchronization. So, an easier way to migrate IMAP mailboxes to Office 365 is using affordable IMAP to Office 365 tool. You just need the login details with server name and port number to migrate your IMAP mailboxes. The migration is performed in just few steps. The software costs cheaper than other migration tools and performs with full efficiency. 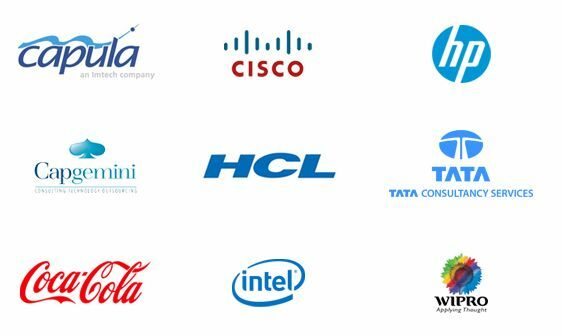 Our organization as most of them are, is also going for cloud migration. Email client AOL.com includes some vital data in IMAP folders. So, provide me instant solution for retrieving IMAP data in Office 365 location. 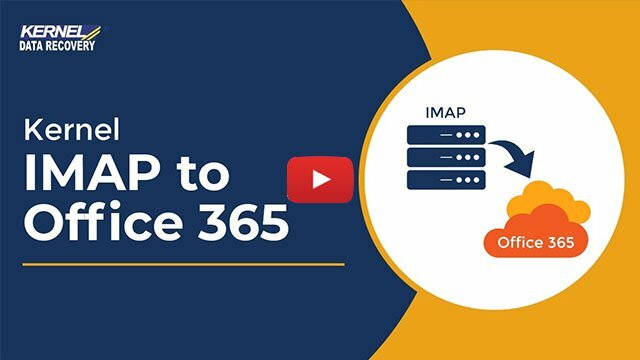 It is possible to access your IMAP data easily at new location with IMAP to Office 365 migration tool. Just download the tool; enter the login details, server name and port number and get back your IMAP mailboxes data. The migration tool provides an easy approach allowing migration of only required data with advanced filters. You can save this retrieved data to Office 365 and Exchange Server. Can I migrate IMAP folders from Office 365.com account to cloud? Yes, surely. The software supports almost all IMAP enabled email servers for migration. 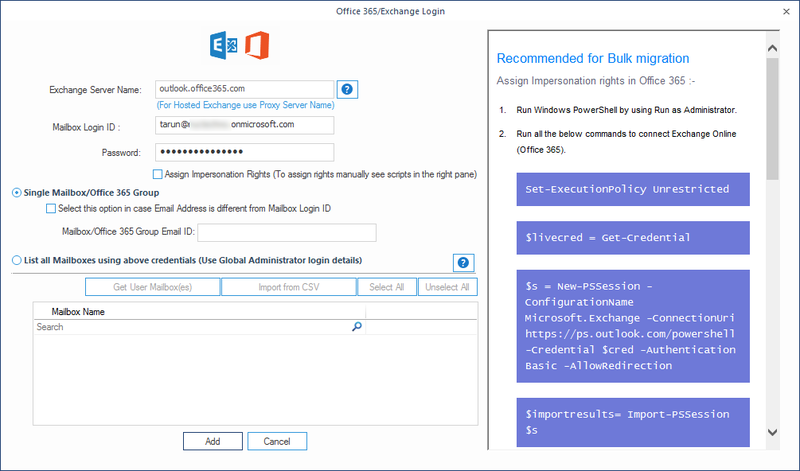 For migrating Office 365.com account, the server name and port number is also available at the tool’s interface. You just need to have Office 365.com login details along with you and destination login details too. Nice lookout and interface of the tool. Fine facilities and options for make selections of data for operations. Full points to the design. This is a win-win deal I would recommend this to everyone in need. Thanks to this amazing tool that helped me a lot. Mapping Source and Destination mailboxes.